I know this is going to sound odd coming from a man who has just passed the midway mark on his 20’s, but comics mean a hell of a lot to me still. Though it’s been intermittent, when I look back on it, I’ve probably been reading comics for most of my life. I can’t deny just how much that must have shaped my entire world – from popping down the local shop to harass the owner to make sure the Beano was in every week, to discovering Dan Dare and 2000AD on holiday one year where the campsite had an entire garage of comics to take and read – it’s been a constant in my life. When you throw in Tintin and the various Asterix books and lots of one off indie collections it was was a pretty varied childhood too. Though many see them as the dominant form at the moment*, I actually came to American Superhero Comics pretty late into my teens, though it didn’t stop me devouring them. Especially after reading The Death of Superman, which due to my age actually meant something to me. The sheer sincerity of that moment is crystallised in my mind – if those behind it’s production were cynical about it all, then the writers sure didn’t seem to be. Then there’s the things that really blew my mind and made me realise what superhero comics could be – Grant Morrison’s Animal Man and other Vertigo titles, weird wonderful creations that made me feel like there was this world out there waiting to be discovered. Then there’s Planetary. I don’t know what it is about Planetary – but it’s something that still love to this day, perhaps unconditionally. For all it’s problems, it’s a comic about embracing the history of the weird and wonderful things that make us all essentially human. 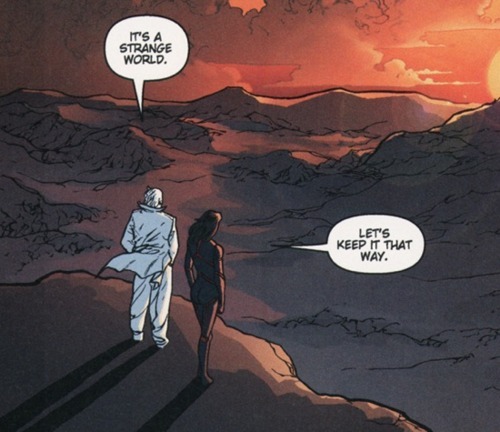 If Superman taught me that we should love others for who they are, it was comics like Planetary that provided some of the context. The above image is of one of Jakita Wagner, an eternally optimistic (though deadly) member of the group who works for Planetary. Partially because it lets her see and experience places and people she never has before. All because of a notoriously low boredom threshold. Now whilst as a person I don’t think I’m quite of the same temperament, I can’t deny that part of my desire to see new things comes partially comes from that. In a way, Ellis and Cassaday were just ahead of the curve on predicting the ‘ADHD culture’ the internet has helped create, both The Drummer and Jakita tending to seek pleasure and instant gratification. That they can flutter between long and short term tasks is something I don’t think many of us have mastered yet in any meaningful way, or if we can it’s taken as a sign of maturity. In the end, the ‘cultural archaeologists’ of the comic are exploring the past, the potential that is squandered by each generation (with a bit of a dig at the monolithic forces of business that hold us back for their own gain). But rather than chastising us for it, it instead takes a look at what worked, which can be carried into a better future. That a world view worth having. One that was shared in a way that only comics can do. It’s part of why I love comics. *People always seem to ignore Manga, or any of the extremely popular Indian comics styles that are being published, when this proclamation is made. I too have loved comics all my life and still do. This article speaks to me.